The Farr Out Family: My Birfday! I had a wonderful birfday! I woke up to the house decorated and a big suprise waiting for me! I was so excited to see it! Then I went to lunch with Cary to Zupas yummy! Then we went to the dr. and saw Baby. Then we went SHOPPING and I got a new shirt. We then starting driving home when our car battery died... so we waited on the side of the road until Jordan's dad picked us up. Then we went out to eat at Olive Garden ... SO GOOD! Then we finished the night off with a dollar movie... Prince Caspian. It was such a good day. Thanks to everyone! 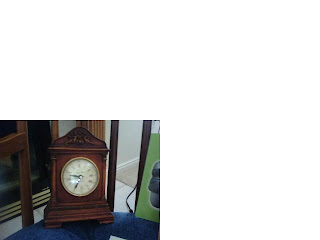 I got a old fashioned clock for my clock collection! And a poopy baby card! 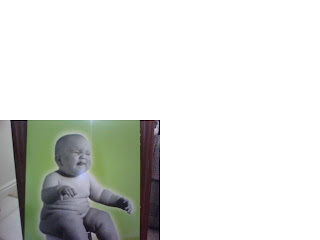 Heeee,,, hmmm I wonder if this is what baby will be like? 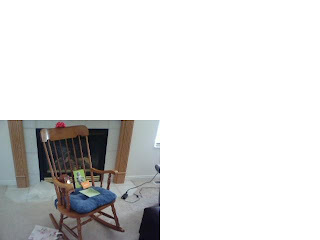 Jordan gave me a rockin' chair. I was so excited! This is Jordan studying for the CPA exam. He looks so focused!! I got a PIANO! I have had so much fun playing it! I will put on my very own recital when you come to visit us! Everyone has wondered where my belly pictures are so here is one... I no longer have a belly button. hehehe I'm getting a little volleyball pansa! That is a beautiful belly! I can't wait to see it in person! Love your piano! It's beautiful. I can't wait to tour your new house. and I can't wait to see you. Hopefully soon! 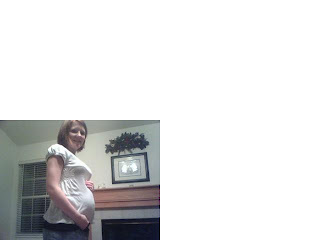 Lori, you are such a cute pregnant gal! Congrats again! I didn't know you guys had a blog too! Since I started working night shifts I can't sleep at night when I'm off, so I spend my time blogging! Hey I was just wondering what you need for youre little girl. Let me know so I can send so things.